Entering an abandoned artist’s studio in Southwest Cornwall was about as magical and mysterious as it gets. I have visited many artist’s studios, but nothing can compare to the unique experience I had there. The studio wasn’t eccentric or showy; no crowds hanging around hoping for a glimpse of the artist like it was above Dali’s studio in the 70s in Portlligat, Cadaques. Nor was this the studio of Picasso in Vallauris near Cannes with echoes of a 20-year-old Brigitte Bardot. Instead, here in the studio of this well-known artist were other ghosts of the past. Though I haven’t asked for permission from the artist, I feel it would be an invasion of privacy to reveal his name, possibly leading key actors from the art world to place their judgement, not something I feel could be justified in this moment. We will leave the name of the unidentified artist here for now. And yes, I would like to protect him, to keep this special space out of prying eyes. Clearly no longer used by the artist for many years, bramble and weeds covered the long and winding pathway that led to this well-hidden studio. Along the way was a huge 2-storey aviary that was more like a sculpture of a birdcage, partially covered in ivy with a large tree growing in the middle. It made me imagine a once manicured garden but also one full of birds and life. I entered by the main door of the studio directly into a sun-kissed kitchen with a large kitchen-wide window where overgrown greenery grew directly against it. I envisioned animals and birds passing by and being able to observe them up close like in a terrarium. Beautiful ceramic plates and bowls were on shelves, calling to be touched or even caressed. There were screws neatly placed in the wooden beam above the sink where pots and pans hung. The kitchen was amazingly functional and well set up, in sharp contrast with what was yet to come. The living room area had a wall lined with art books dying to be opened; there were arm chairs, wooden university chairs from the States and couches that once must have held lofty conversations on art, which all made me wonder what had taken place there and what had been said. Words now gone – lost. Everywhere covered with decay, spider webs and dead flies on the floor which stuck to my shoelaces and shoes, along with a thick layer of dust. It made me think of Miss Havisham’s dining room in Dicken’s Great Expectations where the remains of a twenty-five-year-old wedding cake, covered with spider webs and dust and decomposition everywhere, displayed a broken heart, a wedding that had never taken place. Was a heart broken here too? In any case, the originality of this studio, which only an artist could have created, had a powerful and magnetic aura to it. The artist’s workplace, a large room beside the kitchen, was the pièce de résistance, paintings, sculptures, paintbrushes and paints discarded around finished and unfinished works in an array as though something had happened to make the artist abandon it all, perhaps suddenly. Ivy now growing inside the studio, having insidiously entered through some small crack was creeping round the walls. However, inside the studio was quite revealing, like a documentary, giving me a glimpse into the soul of a man who had left behind everything. Nothing was missing here, except life. Perplexed and with many unanswered questions, I reflected on the artist who had lived and worked here and if perhaps he had lost his way, but above all, why had time stopped here? 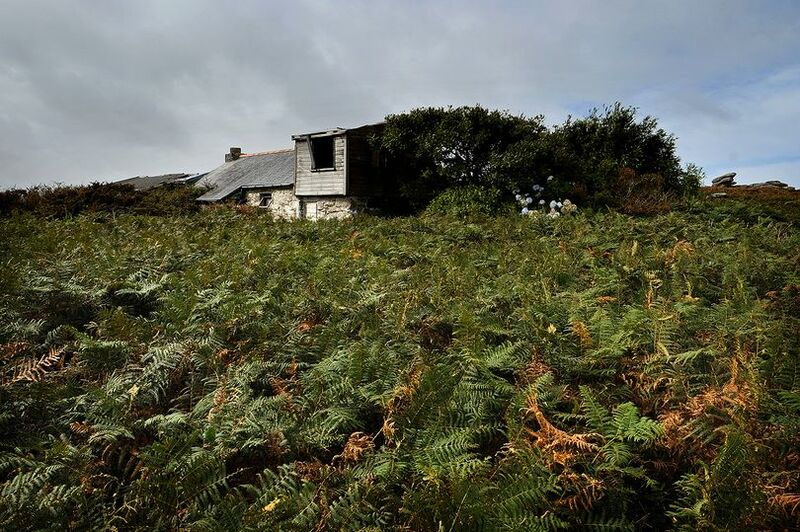 The visit to the artist’s abandoned studio in Southwest Cornwall, planned for January 26, has had to be cancelled since the studio has been rented and is now being repaired. Understandably, the tenants would not like to see busloads of visitors arriving to see the studio. We apologize to those of you who made a reservation; you will receive a full refund of your deposit. We are a women’s group in Cornwall who very much would like to know where this studio is located so that we can visit it. Do you think this would be possible? We also would like to know who the artist is, as the suspense is too much. Could you please tell us who he is? Who does or did this studio belong to? Cannot it really be revealed? Is this the studio for rent, Carn Cottage near Zennor, where the artists Bryan Wynter and later Margo Maeckelberghe lived?